In this important and timely study, Frank Kirkpatrick draws on theology, political philosophy and the social sciences more generally to develop a Christian ethic of community. Frank G. Kirkpatrick is Professor of Religion at Trinity College in Hartford, Connecticut. He is the co-editor of the series 'Blackwell Religious Ethics' and is author of many books and articles, including Living Issues in Ethics (with Richard Nolan), Community: A Trinity of Models, Together Bound: God, History, and the Religious Community, and To Gather the Nations: A Christian Ethic of Flourishing and Justice in a Postmodern Age. 1. Moral and Scriptural Foundations. Scripture and the Ethics of Community. 2. Historical Experiments in Community: Europe. Community in the Monastic Tradition. 3. Historical Experiments in Community: America. The Creation of the American Republic. The Struggle Between Individualism and Community in America Today. 4. Building A Philosophy of Community. John Macmurray and the Philosophy of Community. 5. Political Philosophies of Society. 6. Community and Society: Difference and Engagement. 7. Turning Inward to Community: The Family and The Danger of Too Much Community. Dangers of Too Much Community. 8. Working Outward From Community: Economic Justice and International Order. A Good and Just Society. The Ethics of Economic Justice. 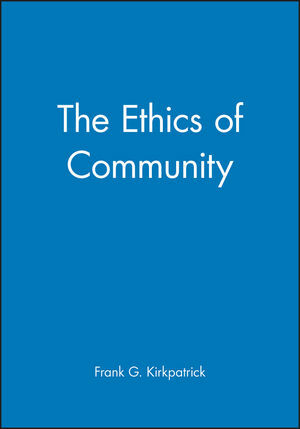 The author has a lifelong interest in the ethics of community - no one is better qualified to write this thought-provoking book . Draws widely on theology, philosophy and the social sciences generally. An important and timely contribution to the series - fills a much needed gap in the literature. Written in a clear, accessible style - Kirkpatrick is able to communicate complicated and challenging ideas in an entirely user-friendly way. Balances theoretical considerations that are important in interdisciplinary debate and practical considerations that are significant in daily life and politics. Provides a usable model for ethical and theological reflection.